Liam McGeary is set to become the first Brit ever to claim a major MMA world championship as he challenges Emanuel Newton for the Bellator light heavyweight world title in Conneticut, USA, this month on February 27th at Bellator 134: McGeary vs Newton will go down at the Mohegan Sun arena in Coneticut topping a bill stacked with British fighters, aptly named ‘British invasion’. British banger McGeary, originally from Andover, started his martial arts career in the channel island of Jersey and now fights out of Renzo Gracie’s MMA academy in New York. Should he win, he will be the first British fighter to claim a major world title in the sport in what would be only his tenth professional fight. Undefeated at 9-0 (6-0 Bellator) with all of his Bellator wins coming inside the first round, he is widely touted as the man to take the strap from the significantly more experienced Newton (25-7-1) who holds notable wins over ‘King Mo’ Lawal, Attila Veigh and Joey Beltran. McGeary is yet to see the second round since signing with Bellator, boasting two submissions and four knockouts, with the average time it takes him to dispatch his opponents coming in at under 2 minutes. He blew through Bellator’s Light Heavyweight tournament and earned himself a shot at the gold by defeating American Top Team product Kelly ‘Crossface’ Anundson in the final via spectacular inverted triangle, a move which earned him Inside MMA’s ‘Submission of the Year’ award. 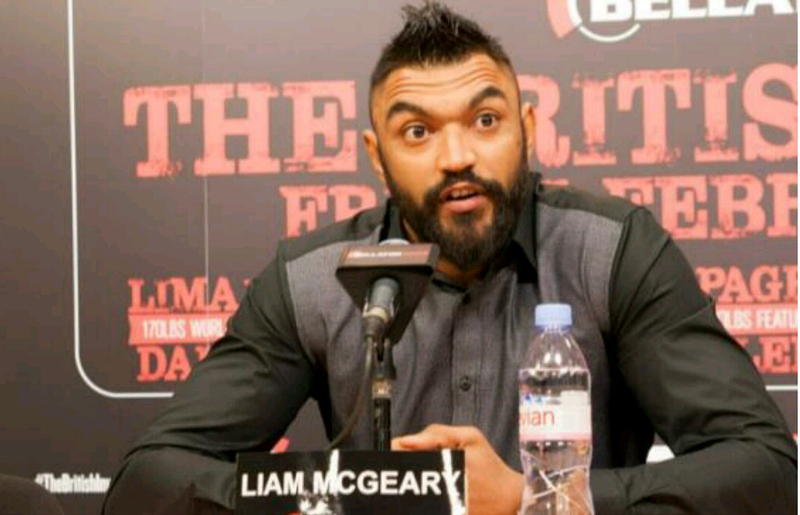 Last month all the British fighters on the card, which McGeary is headlining, converged at the Channel 5 television studios in London to promote the event and answer questions from the national MMA press…. “I really don’t know how he’s going to back that one up” said McGeary when told that Newton dismissed him as a worthy challenger and stated that he refuses to be beaten by a Brit. “I am going to beat him up everywhere, I won’t let any chances slip and the belt is coming back to Britain – I just can’t wait (until February 27th) to stop having the fight in my head and have it for real!”. ‘British Invasion’ goes down at the Mohegan Sun arena in Uncasville, CT, USA, February 27th and the world’s MMA press will be on hand to see if McGeary can overthrow Newton in his backyard and bring the belt back to British shores.